Stay 3 nights or more in Low Season (June -August) and get 20% off. 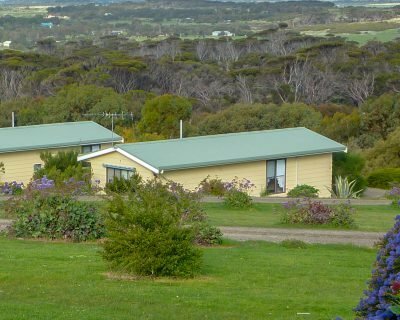 Cabin 2 is part of the Emu Bay Holiday Homes complex. Identical to Cabin 1, it is a rustic cabin with beds separated by dividing curtains. 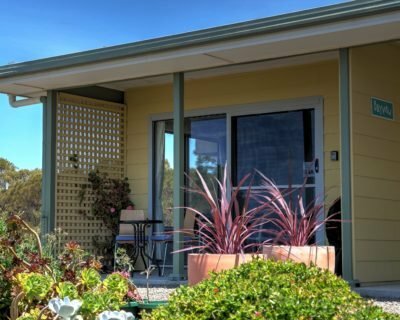 It has a fully equipped kitchenette with small bathroom comprising shower, basin and toilet. 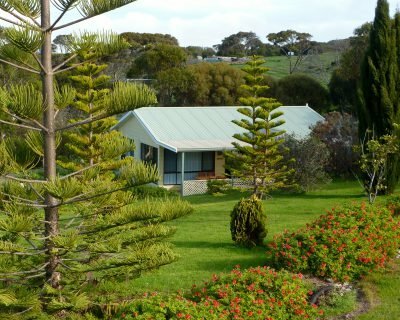 It offers great views with outdoor seating and BBq on the large protected patio overlooking Emu Bay. 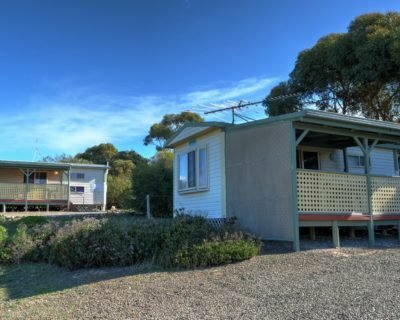 Koalas often frequent the trees alongside the cabins. We had a wonderful stay. The view from the cabin is amazing and the sunrise stunning. Incredibly peaceful and relaxing. The cabin was clean and well stocked. Thank you. Also saw a koala in the tree outside to the left on our last morning. Just keeps getting better! Very pleasant. Cabin was well stocked. View was gorgeous. Incredible value for money. We enjoyed playing Chess in front of the kangaroos and ocean. Justine and Alex, Adelaide.